Maestro Tovey was awarded the title of Honorary Patron of Carl Orff Canada at the Opening Ceremonies of the Vancouver conference in April. Past-President Catherine Bayley gave the following tribute. Last year I was invited to a concert at a local high school. The music director at the school was very excited about the event because he had invited the entire high school, and the Grade 6’s and 7’s from the surrounding elementary schools to come and hear his band and choirs perform and listen to a presentation from a very special guest. That morning the gym floor was packed with high school students and the bleachers were buzzing with hundreds of 11 and 12 year olds. As you can imagine, with an audience like this, the atmosphere was very buoyant and energetic, to say the least! The students did their best to listen respectfully to the band and choir performances and applauded lustily at the end of each piece. However, when the music director stood up to introduce the special guest, one might have wondered how this guest would be received by a crowd growing somewhat restless after 30 minutes of being on best behavior. I’m sure you’ve guessed by now that that special guest was Maestro Bramwell Tovey. From the minute he began his presentation the students were instantly engaged and listening intently. They immediately responded to his passion for music and his ability to convey that passion through words, through humour, and through his awesome piano playing. His audience also truly appreciated his respect for the experiences and interests of everybody in that huge gym, young and old. These facts alone would be enough for Carl Orff Canada to consider ourselves extremely fortunate and honored that Maestro Tovey has accepted our invitation to become an Honorary Patron. However, during his time in both Winnipeg and Vancouver Bramwell Tovey has also proven himself to be a strong advocate for the importance of music education in the lives of young people. In Winnipeg he worked with Marcelline Moody to initiate a program to involve school children actively in the Winnipeg Symphony’s elementary school concerts and this program continues today with thousands of children participating every year as either performers or audience. He also founded Winnipeg’s highly regarded New Music Festival. As this festival quickly gained great prestige in the music world, Bramwell was always willing and excited to include performances and composition from school children. This strong commitment to music education has continued here in Vancouver. 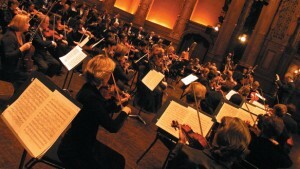 Bramwell was involved from the inception with the Vancouver Symphony Orchestra’s educational outreach “Connects” program. He regularly gives his Meet the Maestro presentation at both elementary and secondary schools, and often, to the delight of the band director and students, will go into school music rooms to rehearse a school band, as part of this Connects program. He also makes a point of conducting one set of the VSO’s Elementary School Concerts and one of the VSO’s Sunday afternoon Kids Concerts. I have attended many of these events over the years and just like the students at that high school I mentioned earlier, the children, and adults, come away from these concerts with much more knowledge about music, and a real enthusiasm for what they have just experienced. Finally, I would be remiss if I did not tell you all about one particular action of Bramwell Tovey which further endeared him to music teachers across the province. Two years ago, because of a budget shortfall, the Vancouver School Board was considering cutting all band and string programs in the city. Maestro Tovey thought it important enough to take time from his very busy schedule to attend a School Board meeting and deliver an eloquent and heartfelt speech to the board urging them to retain these programs. The speech was subsequently printed in the Vancouver Sun newspaper and read by people across the province. The Band and String programs were not cut and many teachers believe that this was due in no small part to the intervention of Maestro Tovey. Maestro Tovey, Carl Orff Canada’s definition of an Honorary Patron is “someone who has given strong, influential support and encouragement through educational and artistic endeavours.” Your actions and qualifications take you above and beyond this definition. Carl Orff Canada is delighted and honored that you have agreed to become an Honorary Patron of our organization. Would you please accept this certificate as a token of our appreciation? quoted by Bramwell Tovey, keynote address.